Keeping up with the Germans: What can Germany teach the UK on fees, migration and research? On Thursday, 3rd September 2015, the Higher Education Policy Institute publishes Keeping up with the Germans? 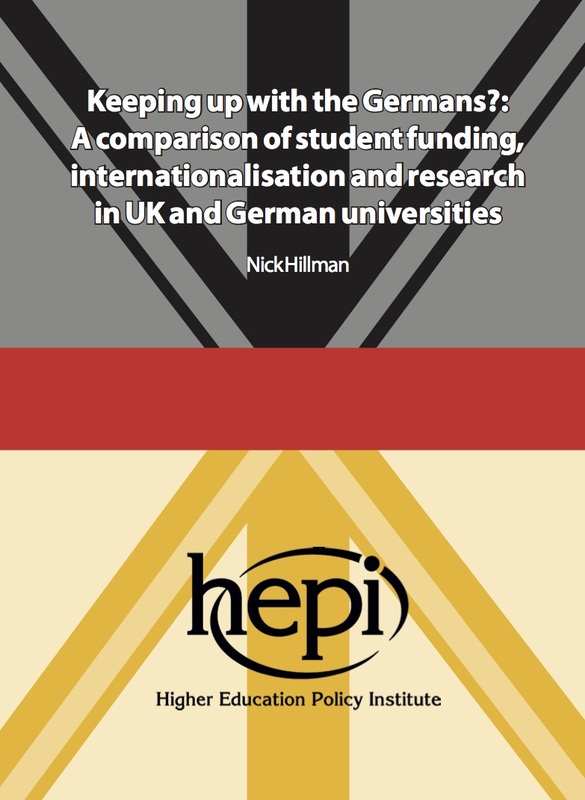 : A comparison of student funding, internationalisation and research in UK and German universities (HEPI Report 77). ‘People in England, Wales and Northern Ireland often ask, if Germany can abolish tuition fees, why can’t we? Part of the answer is that Germany sends a lower proportion of young people to university and spends less on each one. When fees existed in some German regions between 2006 and 2015, they were small and those regions which had them were played off against those that did not. While many people believe Germany has lit a path for England, Wales and Northern Ireland to follow, many Germans regard their current arrangements as unsustainable. On this, and indeed many other higher education issues, there are sharp parallels between higher education debates in Germany and Scotland. ‘Where Germany undoubtedly has clear lessons for the whole UK is on its open approach to the internationalisation of higher education. While UK universities continue to perform better than German ones on international engagement, the UK is hunkering down while Germany is opening up. There are things the UK could learn from Germany on the calculation of the economic benefits of educating international students, as well as on post-study work and where policy responsibility for internationalising higher education should rest in government. While tuition fees have been abolished in Germany, this was affordable only because the country sends a lower proportion of people to higher education and spends less on each student. Moreover, fewer than half of Germany’s 16 states had fees, which were low (typically €1,000 a year), and administrative charges continue. While some English academics see Germany as a model for abolishing fees, some German academics worry about underfunding. The UK higher education sector remains more international than Germany’s, but Germany is moving forwards while the UK risks moving backwards. For example, Germany has a clearer cross-government strategy for inward and outward student mobility. It is also more positive about post-study work: Germany includes the income tax contributions of international students who remain in the country when calculating the benefits of international students. The UK and Germany both do very well from EU research funding and the depth of research collaboration between the two countries is a prime example of cross-border links working to the benefit of all. Arguably, the decision of British universities to launch a pro-EU campaign lacking specific requests on the future of EU research spending is a missed opportunity. The German research base is characterised by non-teaching institutions and looks complicated, but also relatively well-funded, when compared to the UK’s. Its structure also leads to underperformance in the global league tables, making German research appear less good than it really is. For example, if the Max Planck Society were included in the Shanghai Jiao Tong University league table, they could displace Cambridge as the top placed European university and knock Oxford out of the top ten. However, there appears to be some convergence between how research is undertaken in the UK and Germany. On higher education, there are stronger parallels between Scotland and Germany than between England and Germany – not only on tuition fees but also on demographic concerns and the autonomy of higher education. The author fails to mention, why less people seek a university degree in Germany, and why you can’t quite compare the two systems. – If you want to call yourself a carpenter (for example) in Germany, you have to qualify yourself in an apprenticeship, following the dual model. Mandatory Berufsschule (Schools teaching job skills broad and specific) and a training in a company that lasts normally three years combined, under close supervision of the states and the chambers of commerce guarantee a good level of job-education. A carpenter with a good exam can easily get a job and with the payment from that job a family can live. A lot of jobs (thousands of different jobs) are taught this way, a way that in GB often requires attending a college. – Attending university normally leads to a “master degree” or a doctorate, the level is quite high, “bachelor degrees” have only been introduced in recent times to make low level university education comparable to other european states. – Although there are small or no tuitions, a student has other setbacks. For example, the cost of living in Germany is very high, and there are families who can’t afford sending their children to university. And branches of study that are in high demand have a numerus clausus, that means you have to have a very good Abitur-grade to get accepted. If you want to study medicine, you still need a grade of 1.0 (a straight A) to get admitted. – As a German who has seen a lot of the world I can say that I’m very proud of our system of education. Our “dual mode appenticeships” are exported to other countries that have seen the value. I heard of Turkey, Brasilia, Latvia, Israel, Portugal, that want to adopt this system.